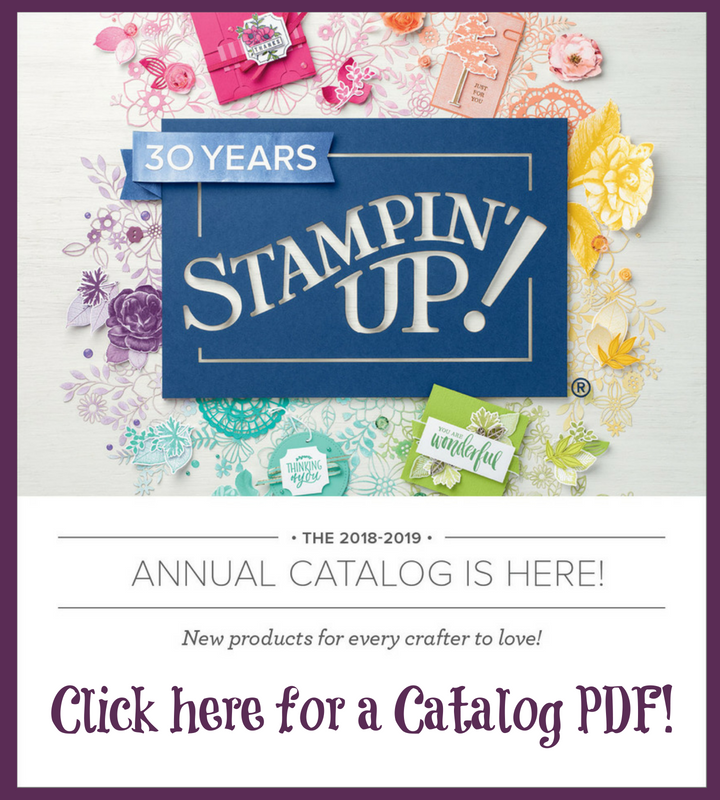 Welcome to my stop of the Stampin' Addicts Sale-a-bration Blog Hop! Starting January 4th through March 31st, you can get one of the products we are featuring for FREE with a $50 purchase. 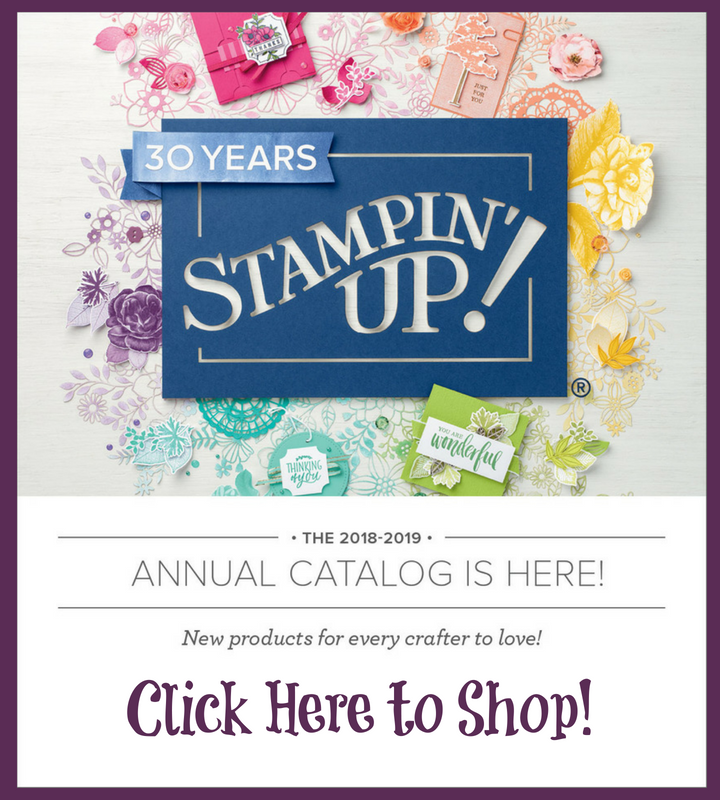 I love this time of year for replenishing my supplies as well as the fun new products we can buy, which in turn, helps us earn more free products! 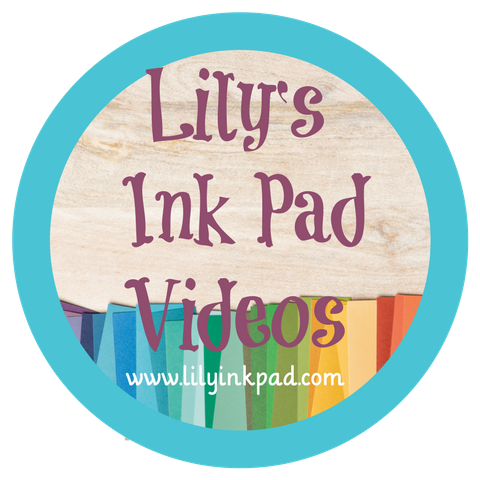 Did you come directly from Twila's Blog featuring So Very Much? I love the font of that Thank-You! Or are you hopping backwards and came from Mickey's Blog featuring Any Occasion. I love how so many little banners can be made with it! 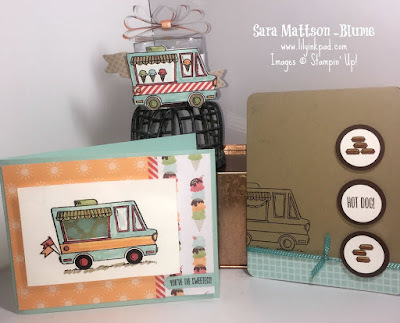 My stamp set is called Tasty Trucks (p 12) and is a whimsical food truck with fun sayings to pair. I started by pairing the Tasty Trucks set with the Cool Treats Suite from the Occasions Catalog. The colors are bright and fun! The hot dog card is pretty self-explanatory as it uses the accessories as a highlight in the circles and a plain truck in the background. The fun tablecloth paper is from the Tasty Treats Speciality Designer Series Paper Pack. The card on the left is actually a shaker card. Does this picture help you see the Sprinkles Embellishments inside the window? I loved the Peekaboo Peach Designer Series Papers with the Suns. It screamed Ice Cream Truck at me, so I had to make this truck into an ice cream truck full of sherbert-y colors! I owned the printed window sheets and thought the peeking gold lattice looked like a fun addition to my already fun truck. I added the sentiment with the Classic Label Punch folded under the side. The treat box on top was very fun to create! I picture it as a party favor on a table for an ice cream themed birthday party. The truck's stripes are actually washi tape from the Tasty Treats Washi Tape-I only had to trim the ends and I did that with my paper snips! The "flag" the truck is placed on is a banner from the Bunch of Banners Framelit Dies. I used the waffle cone paper from the Tasty Treats Designer Series Paper. I the belly band around the Clear Tiny Treat Box is a strip of the embossed ice cream paper from the same pack. The bow on top is a series of layered loops connected with mini-glue dots. My finale is a card that doesn't use the Cool Treats Suite. Gasp! A taco truck!!! I love the colors here. 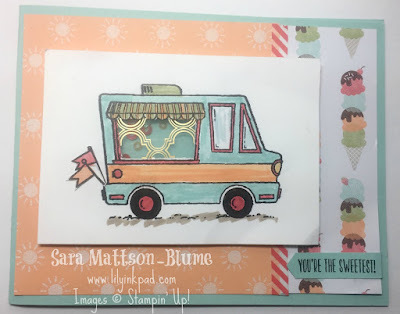 I started with stamping the truck, then thought, "What colors do I use?" I looked down and saw this pattern from the Sale-a-bration Only Carried Away Designer Series Paper. Very fun! I hope you enjoyed my projects. I'll have more pictures on Sunday, January 2nd for you to peruse as well as supply lists. Click next to visit Mickey's Any Occasion projects (or go backwards to visit Twila's So Very Much projects. 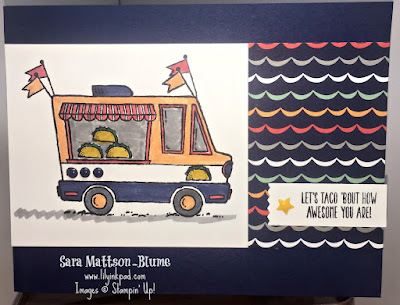 These are super cute, Sara!! I love them all! The shaker card is a great idea and the treat box is awesome!! Wonderful cards Sara! I especially love the hot dog card, it makes me smile. 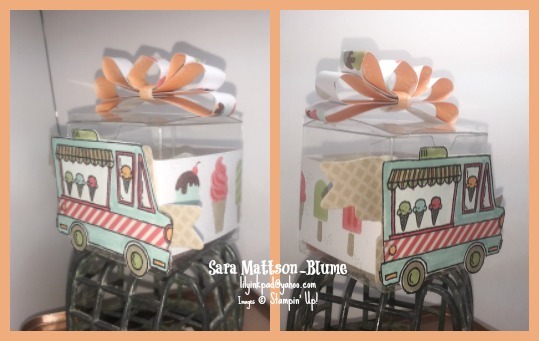 Sara, your projects are just adorable! That food truck with the clear box is just so fun! Such cutie pie cards Sara! I love this set, and you made me love it more!! Great idea on the clear box too! Super cute, Sara! I love the shaker card idea and the printed window sheets was a perfect touch to it. Cute little party treat too. Great work!